Welcome back to the Digital Skillscast! Our guests include everyone from entrepreneurs leading innovating software companies to folks who whelp people learn how to adopt and use it. Our goal with these conversations is to help you better understand the technology landscape so that you can navigate it and help your own organization close digital skills gaps. 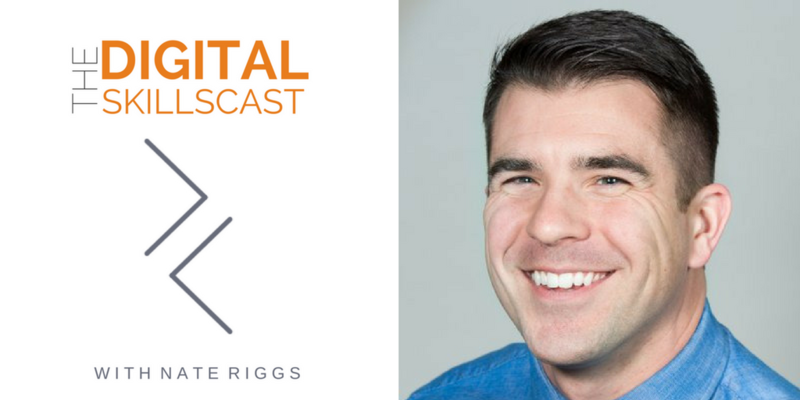 In our last episode, we talked to Patrick Connor from The Digital Academy. The Digital Academy is an education management system that helps learners to achieve success by offering an individualized learning environment and by enabling engaging content that includes 21st Century Skills in Computer Science and STEM. The system offers courses online without any software downloads AND provides course materials and training for teachers. Some of those courses even offer College Credit Plus credits for Notre Dame, AP Test prep solutions, and various certifications. If you're interested in hearing more from Patrick's episode, you can find it here. In this episode, we talk with Dr. Anne Marie Richard. Dr. Richard is the Director of Student Technologies at University of California – Berkeley and leads a very progressive student-led IT work program. Anne Marie Richard's background includes more than 20 years of professional experience in IT leadership and management, program design, research, and teaching, in a range of settings including higher education, public agencies, and non-profit organizations. She graduated with a Bachelor's of Arts in Peace and Conflict Studies, then earned her Master's of Arts in Social and Cultural Studies before going on to earn her PhD in Social and Cultural Studies in Education – all from the University of California–Berkeley. Anne earned her stripes as a Senior Associate at Kensington Research Group Assist. before heading back to UC Berkeley as the Director of Academic Services. She held that position for almost five years before she moved on to work as the Director of Student Technologies, which is her current position. One of the big initiatives that Dr.Richard works with in her role at UCB is with the student-run IT program. Both the institution and the students benefit from this new model of IT support. Students working these campus jobs get to gain valuable work experience and opportunities to learn relevant skills that help them prepare for a career after graduation. Many students are able to start careers in higher than entry-level positions due to this relevant work experience. The university benefits from this structure by employing individuals who provide a unique (and first-hand) experience to the needs of student technology and a student perspective for the organization. Student Affairs IT (SAIT) at UC Berkeley has 108 part-time student employees that work with a student help desk, residential network, management of residential academic computing labs, security and copyright education and incident management, systems administration, desktop engineering, and support for student software downloads. These employees also support the staff help desk and help provide technical training to campus staff. Another extremely important aspect of the program is that SAIT recruits a diverse staff. They reach out to lower-income students who need on-campus jobs and focus on female, African-American, and Latino student, which are groups that are typically underrepresented in the technology industry. By giving students an opportunity to learn valuable skills that are relevant to their field while they're in school, SAIT is giving them a leg-up on a competitive field after graduation. Some students even transition into their career at UCB from their student position. Employing and focusing on underrepresented groups is also making a positive change in the tech industry as these students move into their careers. Be sure to listen to the full episode to hear Anne Marie talk more about innovation and outcomes of this student-led program and how it's providing value to both students, universities, and the workforce.